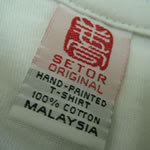 The Setor Original store is located in Gurney Drive Night Market Stall (Beside hawker center and near to Gurney Plaza), Penang, Malaysia. You can get various type of original painting goods from the store. 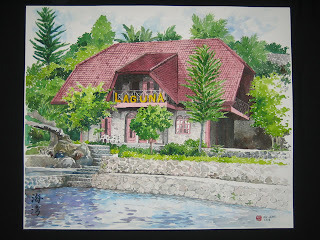 All paintings, hand painted t-shirt, bookmark, greeting cards and etc are original painting or only one in the world. The artist can draw and paint the requested drawing on the spot. Please let us know if you have any request. We can contacted by this email: inblues@gmail.com. We take online order. Setor was born and educated in Malaysia and attended Malaysia Institute of Arts (Diploma in Graphic Design) in Kuala Lumpur, Malaysia. During years 1990-1995, running an art gallery at Kukup Fishing Village, a very famous tourist attraction in southern part of Malaysia, which start selling art to tourists from all over the world. In year 1996, he move to Kuala Lumpur (KL), the capital of Malaysia and start to have own store there. He have sold more than 2,000 pcs of my painting since 1990. Now, He start his artist life in Penang. Setor have been painting Watercolors painting, Chinese brush painting and Hand-painted T-shirt for more than 15 years. Main focus lies in painting Pre-war Historical Building and Japanese Koi (carp), but he do paint other subjects including flowers, landscapes, feng shui arts, horse, birds and other animals. A significant number of these have been commissioned.